All male human baby do such; again, no biggie. Gad Zooks, we got body parts all over the place! No, the images were meant to hold up for veneration the first shedding of blood of the Christ for us (namely, his circumcision). There were cults of the "first wound" as there would later be cults of the "sacred heart" and so forth. ^ I like this guy, his hair is like mine (besides the white). This man is going places *notices he is a saint* told you. A generation or so earlier, the Austrian nun Agnes Blannbekin "led a life devoted to the foreskin of Jesus". The study says: "She was obsessed by the loss of blood and the pain which the redeemer had suffered during his circumcision. On one occasion, when she was moved to tears by the thought of this suffering, she suddenly felt the foreskin on her tongue. Yeah, I could have gone my entire life without knowing that. 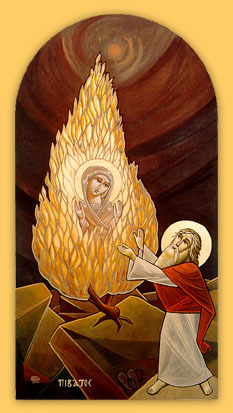 Is there a canon about showing the Theotokos within the Burning Bush? I understand the theology behind it, but it seems like it could misleadingly imply that she was the one speaking to Moses through the bush. Especially in this Coptic version where she's depicted without Christ, though I'm guessing the rules are different there. Do any OO know if this is a canonical image? What is the Theotokos on Intercession frescoe in the left wearing? It looks not unlike epitrachelion and omophorion. 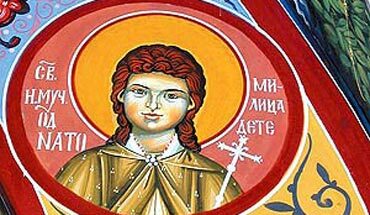 It says - saint new-martyr by NATO, Milica the child. - Her fresco in monastery of Dormition of the Theotokos in city Trebinje, Herzegovina. 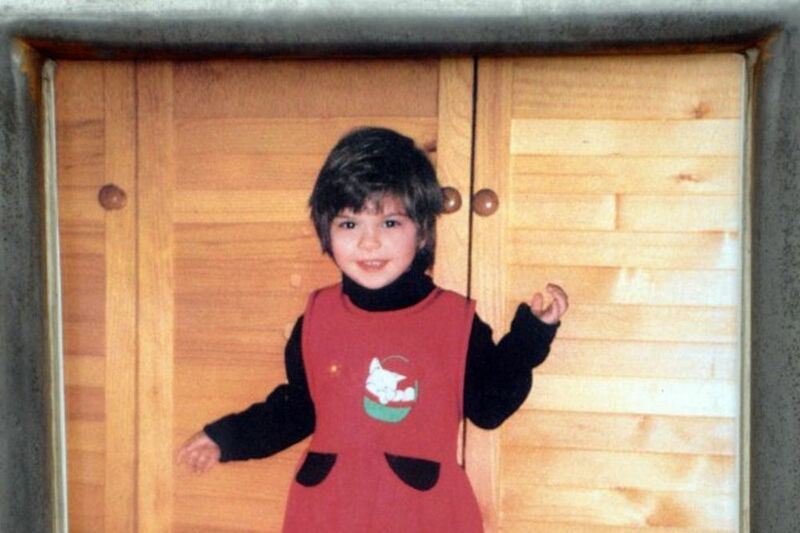 Milica Rakic is 3 years old girl killed by US air-force in her apartment during NATO aggression against Yugoslavia in 1999. 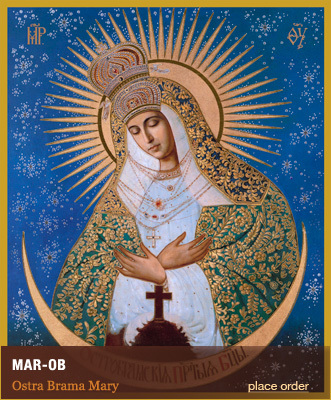 She is considered to be canonized by the Serbian Orthodox Church. According to the law of the Serbian Orthodox Church, a person to be canonized for saint needs to meet at least one of next criteria : martyr death, to gain cult among People, occurrence of a miracle, or saint's body to be blessed - incorrupt relics. She is considered to be canonized by the Serbian Orthodox Church. In other words, she's not "considered to be canonized" in any official way. 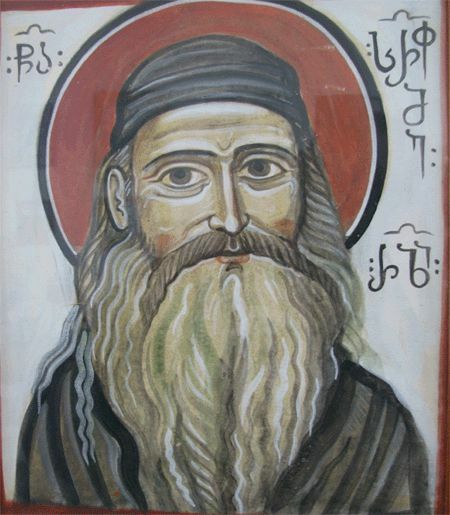 Bishop Atanasije Jeftic, known as the theologian of the Serbian Church, suggested her canonization. By all means please canonize her, her death was a tragedy. But please don't abuse her memory by using her as a club against NATO. The Church needs to be above political squabbles and teach that war is a tragedy regardless of which side is "right." We should demonize NATO. After all NATO is grave digger of Orthodox Christians around the world. Just as we demonized early Roman emperors for killing Christians. We can demonize any group of killers, as they are not a respecter of life anywhere. The NATO group does not specify killing Orthodox because they are Christians. It is not against the law to be so. Though there are groups of killers that wish to kill Jews & Christians and different Muslims for such. NATO's imperialist politics ruined lives of Orthodox Christians in Bosnia, Kosovo, Syria, Ukraine, if they could, they would burn Russia to the ground. I know their goal is not Orthodox Christianity, but they always end up destabilizing countries with large Orthodox population. I like that POV and didn't think of it as you do! Of course, as I understand it, there was "stuff" going on in those regions and NATO responded. It is not the case that they were peacefully minding their own business in a manner that brought joy to all inhabitants. It is also the case that if NATO disbanded then Russia would move into those regions and make many other lives problematic, no? Maybe you think YES, it would be wonderful if Russia moved into Poland, Ukraine, Latvia, Belarus, Estonia maybe Germany, France, and any place else her imperialistic leaders wished? Maybe so, but it's more than I think NOT. HEY, no more, no politics. I forgot, in my passions. Basta! Well it is either Russia or USA who move in to Poland. lol Russia is at least Slavic, just like Poland. And Russia is moving in only in to countries that have vast Russian population, unlike USA which moves in to Iraq or Vietnam which had none US citizens there. Basta! If only we put such passions into Icons, then maybe no strange ones would be on this thread. I don't think it's strange. It's one of the nicer ones on this thread. 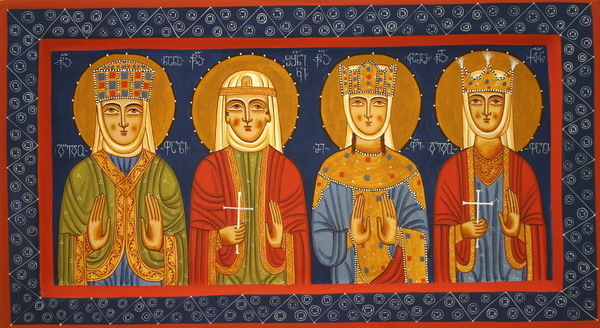 Interesting, are those the four Gospel saints around Christ? 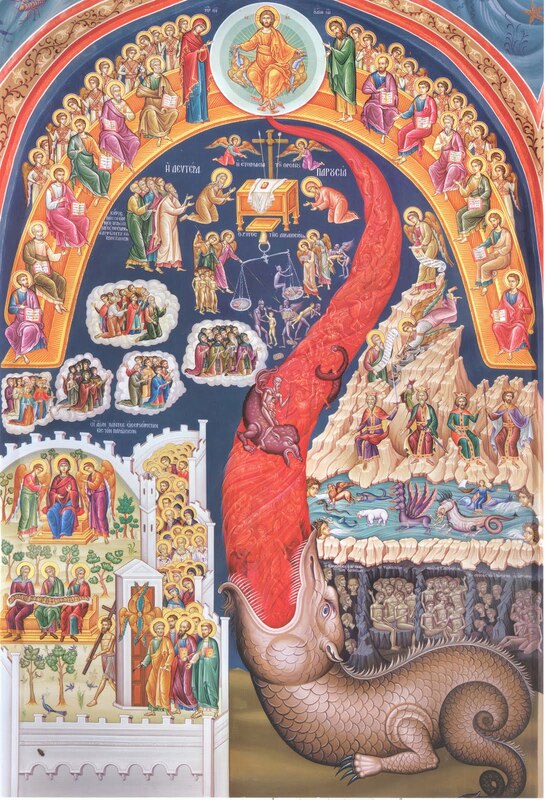 I don't know if this is "strange", but can someone explain what the creature, where the river of fire seems to flow into its mouth, in this icon is supposed to symbolize? Is that supposed to be a representation of Gehenna itself? Wow. Now that there is interesting. From the website of the Finnish Orthodox Church. I have no idea who is depicted here. I think it is Holy Sarah Kali, it's a gypsy popular saint, protectress of the romani people, allegedly Sara Kali was one of the women at the Calvary and friend of the Theotokos. That last one - St. Demetrios, maybe? In the Syriac Orthodox 'shimo' (book of common prayer) you can see the following hymn in the sapro (morning prayers) of Tuesday. sanyo haw daHzo mooshé b-Toor seenay. lek hoo Soy-ar hwo bthulto qadeeshto. sanyo roshem hwo l-gushmek qadeesho. wabthulayk Tarfaw d-lo ethHarak hwaw. w-nuro dabsanyo aloho d-bek shro. was symbolic of you, Holy Virgin. and the leaf unsinged, your virginity. and God Who dwelled in you by the fire on the bush. Oh I know the symbolism. It's nice. It just seems strange to specifically paint her there as though she were there at the time as opposed to God speaking to Moses. But I guess it still works. I'm pretty sure it is, yeah. I like it! It's fitting that a portrayal of an angel would be all abstract-ish. The third icon looks like St. George to me. These are interesting, what are the stories behind them? I think it is somtheing related to the martyrdom of Constantine Brancoveanu and his family by ottoman turks. 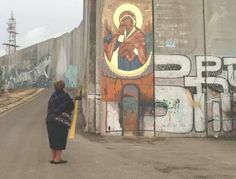 Palestinian Graffiti on the Israelis' "Separation Wall"
Talk about a 'Jesus fish'! I can't believe in all our time together nick didn't regale you with this one of his many enthusiasms.